Once again, Bob Moyer and I have read the same book. I reviewed Margaret Maron’s latest for the Greensboro News & Record, and Bob is reviewing it for Briar Patch Books. I may have treated Maron’s book a tad more gently than Bob did, but we are in agreement that the new one is not among her best. In it, Maron takes her heroine, Judge Deborah Knott, from rural North Carolina to New York City, where she meets the heroine of Maron’s first mystery series, a police detective. The idea may have been to give new life to the earlier series. I suspect, however, that the legions of fans of Maron’s newer series will for the most part just be relieved when the good judge heads home to Colleton County. Margaret Maron has not only carved out a large niche in the soft-boiled mystery genre; she has also filled it with enthusiastic fans. They wait eagerly for the next episode like some people hanker for a tall glass of sweet tea. Her heroine, Judge Deborah Knott, cheerily dispenses justice and dispels family dilemmas in “Colleton County,” North Cackalacky; she usually ends up in the middle of a murder investigation somewhere in the state as well (she’s a district judge). 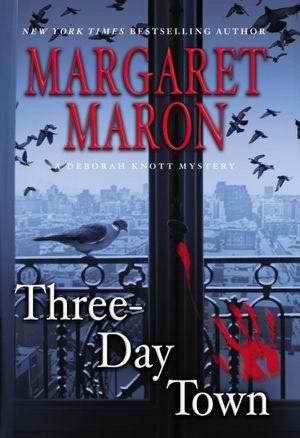 In her latest adventure, Maron takes the judge to Manhattan, the Three-Day Town of the title, for two reasons: a honeymoon with her new hubby, and a first-time meeting with Detective Sigrid Harald, Maron’s heroine from her first series. Staying in a friend’s Upper West Side apartment, Judge Knott is to deliver a package to Sigrid from her grandmother, a grand doyenne back in Colleton County. In the package is a bronze statuette involving some suggestive positions her hubby suggests they try. Before Judge Knott can hand it over, someone uses it to bash in the building superintendent’s brains. A snowstorm hits at the same time, and the building, along with the city, pretty well shuts down. Between schlepping out to shop for shoes and groceries, she can’t keep herself from meddling in the murder investigation. In the process she almost gets herself killed. The apartment building is an interesting setting – there’s a lot hidden in all those closets. Maron lets loose a lot of threads in her narrative, however, that don’t lead anywhere. Just to maintain her Tar Heel ties, Maron also gives the inestimable judge a minor “crime” to solve by phone back home. Finally, the contrast with the no-nonsense Harald does not serve the judge, who refers to her hubby as a Prince Charming and actually says “Carpe Diem, y’all,” very well. Sometimes that glass of Southern tea can be just a little too sweet. Of course, that may just be to a lot of readers’ taste. As for me, I’m looking for a bitter dose of the dark side from Walter Mosley’s next two books, which have just come. To each his own, y’all. This entry was posted in Mysteries, Southern Fiction and tagged Deborah Knott, Margaret Maron, Mystery, North Carolina fiction. Bookmark the permalink.